Fans of the JellyCar series should rejoice. JellyCar 3 from Disney has hit the App Store. And while the latest installment isn’t that different from the two previous versions of JellyCar, the levels and mechanics in this universal iOS game are still creative enough to keep you interested. And JellyCar 3 offers a few new features that add to the game’s enjoyability. In the latest version of the 2D puzzle game, you control a jelly car. To my disappointment, it’s not made of jelly, but rather foam. In each level of the game, you must drive your car through an obstacle course—also made of foam—in search of a small stop sign. When your car reaches a stop sign, you finish a level. Keep in mind that you’re competing against the clock. Complete a level within a certain timeframe, and you earn points to unlock new levels. 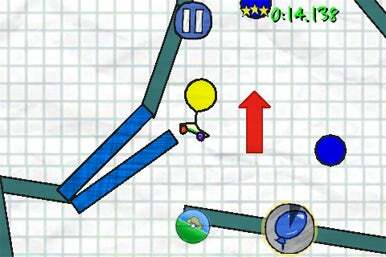 Up and Away: As in earlier versions of the JellyCar series, JellyCar 3 challenges you with odd-but-fun levels, like this one where you have to use a balloon to get to your target. As with earlier JellyCar iterations, this new version features odd-but-fun levels. Obstacle courses in JellyCar 3 are riddled with out-of-this-world properties. In one level, you have to attach your jelly car to a balloon and fly it around; in another, you have to drive your car into a foam slingshot, where you fling your vehicle toward the stop sign. None of the levels are particularly difficult—the game is built for young kids—but adults can still admire the originality. The levels in JellyCar 3 are very creative and visually interesting. The game features intuitive controls. To move your car forward, you just have to tap the right of your screen; tapping the left moves the car backward. Should your car flip upside down—and you’ll flip over quite frequently if my experience is anything to go by—just tilt your iOS device until the car rights itself. While fans of the JellyCar series will find plenty of familiar features in this new version, JellyCar 3 introduces some new wrinkles. If you complete a level in record time, you can go back and replay the same level while racing against a ghost car—-a car that that will mimic all the moves you made during your record breaking race. Though the ghost car challenge allows you to be extra competitive with yourself, it doesn’t add much to the game. In other JellyCar games, when you make a mistake, you have to live with the consequences. JellyCar 3 lets you turn back time to fix your blunders. (You only get to rewind things 10 times, however.) If you’re close to beating a level in a record time but then make one little mistake that puts that record in question, the time machine feature should come in handy. Unlike its predecessors, JellyCar 3 lets you customize your ride. You can change your car’s body type and color. Though customizing your car won’t give it improved performance, you should find it very satisfying to race a car that you designed—I certainly did. JellyCar 3 is not a complete makeover of the Jelly Car game series. However, it captures the feel of its predecessors and offers enough new features to make it fresh and exciting. And, those who’ve never played the game should find it creative and fun. Sam is a former Macworld intern and currently works as a full-time political consultant.